Okay, Whitebox GAT provides users with a very user-friendly means of accessing geoprocessing tools through dialog boxes with built-in help documentation. The dialog boxes are very consistent in design and the tools are each readily accessible from the Tools tab in the tool tree-view and the quick-search lists. This likely provides the most convenient way to access this functionality for most of your day-to-day work. Every now and then however you’ll find yourself in a situation where you have a workflow with numerous intermediate steps and you need to repeat those steps several times over. This is a case for automation. Every plugin tool in Whitebox can be run automatically from a script. In fact, the help documentation for each tool provides a description of how that tool can be scripted. In the longer term I intend to develop a graphical workflow automator that will automatically generate scripts based on a workflow graph that the user creates. This type of functionality, similar to what is found in ArcGIS, Idrisi, and a few others, can be quite helpful for automating certain tasks. They are never as powerful however as directly scripting a workflow and that is why so many GIS users these days have become comfortable with scripting. It’s an extremely powerful tool for the GIS analyst to have. So, that said, below is a Python script that provides an example of how to automate a workflow. 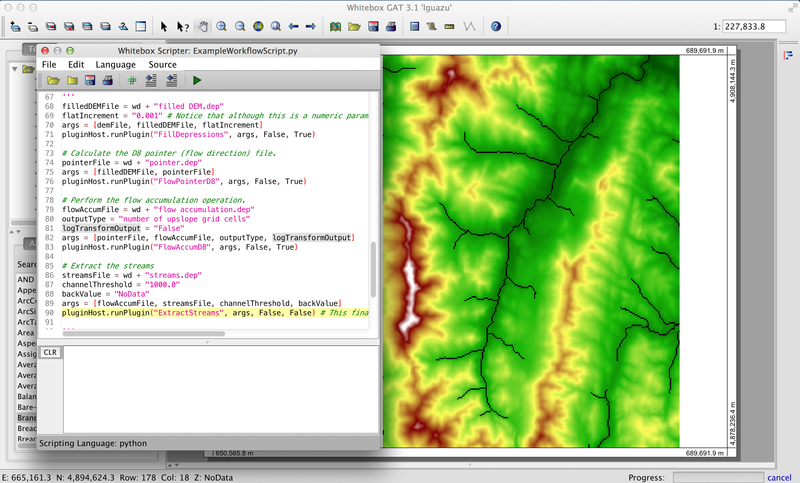 In this case, it automates the very common task in spatial hydrology of taking in a digital elevation model, removing the topographic depressions, calculating the flow directions, calculating the flow accumulation grid, then extracting streams. The script could be made much terser but I added a lot of comments to clarify. Simply paste the script into the Whitebox Scripter and press Execute Code. Scripting in Whitebox GAT can be a heck of a lot of fun and awfully addictive once you realize how much power you have at your fingertips! As always, best wishes and happy geoprocessing. implementation targeting the Java Virtual Machine (JVM). or streams. This is a fairly common workflow in spatial hydrology. reason why the script must be run from within Whitebox's Scripter. # descriptive names are preferred. Whitebox is friendly! Remove the depressions in the DEM using the 'FillDepressions' tool. the required input parameters needed to run the tool from a script. which it should be set to 'False' (i.e. don't suppress the output). output will be treated as normal. flatIncrement = &amp;quot;0.001&amp;quot; # Notice that although this is a numeric parameter, it is provided to the tool as a string. # Calculate the D8 pointer (flow direction) file. # Perform the flow accumulation operation. for the last runPlugin and saved myself declaring the two variables. it is a good idea to dedicate variables to those parameters. I wrote a couple of (python) scripts for my one work (phd thesis). However I do not have a solid background in Python (so far). I would like to know if it possible to include (for)loops in the scripter as well? I would like to run the same script over many files. Could you also provide an example for such a problem? I just posted a part 2 to this entry to give an example of how you can retrieve all of the raster files within a directory and loop through a workflow. I hope that helps out.